Venus flytrap for sale is grown from rhizomes produced by a mother plant. They are usually sold as bare root bulbs. Being one amongst the small number of plants capable of very rapid movement, it can snap shut to catch even the fastest of insects. This carnivorous plant will thrive where most plants won’t: poor soil. However, the Venus flytrap plant is surprisingly adaptable considering its narrow distribution in the wild. Soil – Venus flytraps thrive in poor, acidic, moist soil with good drainage. Avoid using regular potting soil in planting Venus flytraps as this may burn the roots and kill the plant quickly. Do not add lime to the soil and never fertilize the plant. You may use peat, sphagnum moss, sand and perlite in combination. Location – Select an area with partial sun of at least 4 hours a day, but this plant can also live in partial shade. Avoid placing them in areas where there is direct sunlight in the summer as it can burn the plant. It is safer to place them in an area with bright indirect sunlight. 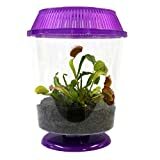 Good air circulation is also an important factor in growing a healthy Venus flytrap plant. 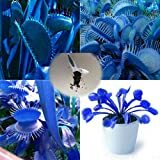 You can also grow Venus flytrap indoors by placing them near a window with dappled sunlight. It typically performs well at an average indoor temperature. A glass container is an excellent choice if you are going to plant this indoors. Water – Only use rain or distilled water in irrigating your Venus flytrap. Tap water is often too alkaline and may contain too many added minerals that are not good for your plant. Do not keep your plant sitting in water. Keep the soil always damp but not too wet for too long. Keep water off the foliage by soaking the plant for an hour in a dish of water to moisten the soil. 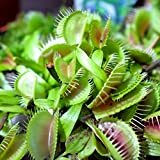 In colder periods, you should be watering only 2-3 times per month during dormancy, depending on the humidity and the size of the pot the Venus fly trap is growing in. 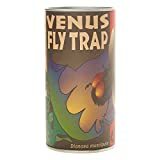 Pruning – It is best not to let your Venus flytrap bloom if you want the biggest traps possible. Cut the flower stalk off as soon as you notice it. This way the plant will use all of its energy in making itself larger or producing better leaves and traps. The name of the plant says it all: the Venus flytrap feeds on flies or other small insects. Its prey must be alive when caught and must move around inside the trap or the plant cannot consume and digest it. 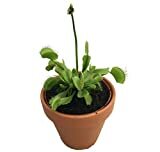 Although it is carnivorous, the Venus flytrap can go long periods without eating insects sometimes up to a month or two. If you plant them outdoors, there will get enough to eat naturally. But if you plan to keep them indoors, you would have to feed them periodically.